If at first you don’t succeed, you got to go on sucking until you do succeed. After several days of trial and error (I will spare you the details) I finally managed to pull up a single slide photo with color. In other words a .jpeg file. I include this as an insert to see if I can do it. The next step will be to enlarge the darn thing. The photo is dark I know, but I took it in November in England. I discovered early on that England (and all northern Europe) is very dark in the late autumn and winter months. The sun rises around 9AM and sets around 4PM. Or at least it seemed like that to me. This is probably why seasoned tourists travel there in the summer months. But I like the dour time of year. My attitude toward life was quite somber for a long time. I am old now, they tell me, so I should be unhappy. But guess what, I am happy. Happiness is in the journey, and old age is a foreign country. I have missed all of you and will be back soon to visit your sites and see what you are doing. In the meantime, keep on trucking. This entry was posted in Elder Blogger, History/Art History, Technology and Science, Travel by SchmidleysScribblins. Bookmark the permalink. Sorry ,typo. 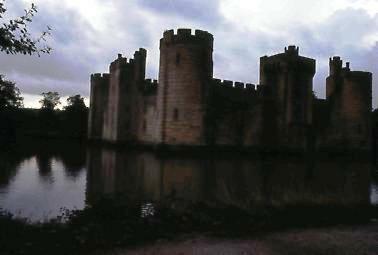 Should have read that your picture looks like Carnarvon Castle in Wales (Anglicized name). Your photograph looks like Camarson Castle in Wales. Are you sure it was England? Inspiratiom with brave words that I need to follow like trash, spare you the details (unfortunately I rarely do that, hence the need of inspiration from your example), declutter and keep on trucking. I love the changing seasons in Britain. I love late summer nights and dark winter nights. I’m glad you enjoyed them, too. A noble pursuit — something I’ve been meaning to do for a while but never seemed to get around to. (Those old VHS tapes of the kids, too.) Hopefully, you’ll inspire me! Good work as a technocrat! You and Kay are wonderful. Yes, Now I can see the castle. Now too you can enlarge it, lighten it, sharpen it, et al, all on Photoshop. That’s what I have been doing with the best of my photographs. Hope your back is vastly better soon. Dianne, did you go to that website I gave you for scanner directions? Yes, Kay, thank you very much.